A virtual hosting scenario where you are hosting different sites. A single organization with two or more sites, which may also some content in common amongst those subsites. www.company-1.com - the subsite for "Company 1"
www.company-2.com - the subsite for "Company 2"
www.company-3.com - the subsite for "Company 3"
The screenshots above show using the Site Manager to configure your subsites. The Site Manager is useful for configuring a live site. When you configure a site initially, subsites are configured on the file system as folders, subfolders and pages. Optionally, these folders can be imported in the database. See the Database Page Manager for details on storing subsites in the database. A profiling rule contains one or more criterion. Each criterion defines an instruction on how to locate a page in the physical portal site map. 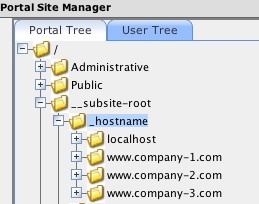 Criterion of the type navigation are used to navigate down the portal site tree. The fallBackOrder tag should normally just be listed sequential. You can almost always get by with a fallBackType of 2. All of the available criterion types are documented in the online Profiler Guide. The table below describes each criterion in our subsite rule and how it is used in a subsite location algorithm. This rule is a subsite location rule that uses a user-role-fallback algorithm. User-role-fallback algorithms first look for a page in the users home directory. If not found there, they then look for a page in each of the users corresponding role directories. There are other algorithms provided by out of the box such as role-fallback, group-fallback, mediatype/language fallback. Or you can create your own algorithms by creating new profiling rules in the XML seed data or with the Profiler Admininistrative portlet. navigation navigation subsite-root Navigates to the physical /__subsite-root directory. hostname hostname (provided at runtime) Navigates to the control directory /__subsite-root/_hostname, and then to the subdirectory matching the runtime _hostname parameter. If the runtime _hostname parameter equals "localhost", then the physical location is /__subsite-root/_hostname/localhost. user user (provided at runtime) Navigates to the control directory /__subsite-root/_hostname/user, and then to the subdirectory matching the runtime _user parameter. If the runtime _user parameter equals "dean", then the physical location is /__subsite-root/_hostname/localhost/_user/dean. navigation-2 navigation subsite-root When a page is not found under the user directory, we start over and navigate back to the subsite root. role role (provided at runtime) Navigate to each role directory of the given user until we find the page. For example, for a role named "role1", navigate to the control directory /__subsite-root/_hostname/role, and then to the subdirectory matching each runtime _role parameters. If the runtime _role parameter is only "role1", then the physical location is /__subsite-root/_hostname/localhost/_role/role1. path path home This is a constant used in all calculations, the path portion of the URL, such as home.psml, or /accounting/worksheet.psml. It is always appended to the calculated path to give the complete physical address of the page. In the case where there is no page specified, the default value provided in the rule "home" is used, and that actually maps to "home.psml" as the default page extensions. 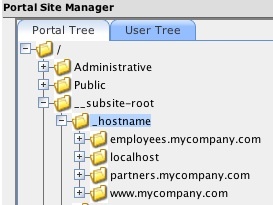 The screenshot below shows the directory tree for a localhost subsite. The rule attribute on the Rule element of a User defines which profiling rule is associated to either a page or menu locator. If a user is not associated with a locator, then there is a system wide locator configured in the Spring configuration file profiler.xml. See the contructor-arg of index = 1. This locator is the default locator, system-wide, for when there is no-associated profiling rule. Normally, profiling rules are associated with user during activities such as the creation of new users with the User Administration portlet, or during new user registration. 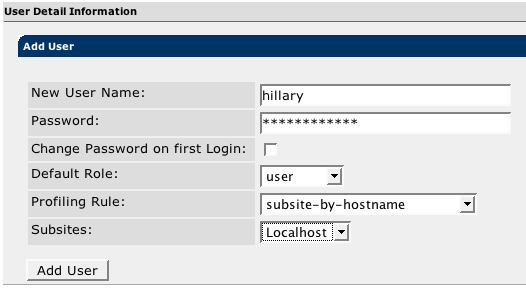 There is an option for hostnames to use the entire hostname or a prefix. 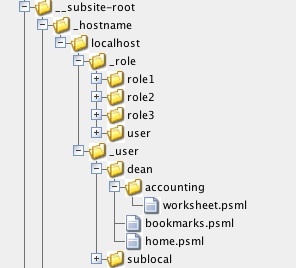 This is configured in the Spring configuration file profiler.xml. By settting the prefix boolean argument to true, the hostname resolve will only look at the prefix of the hostname. For example, with the dot prefix flag set to true, a hostname of "accounting.xyz.com" returns "accounting". 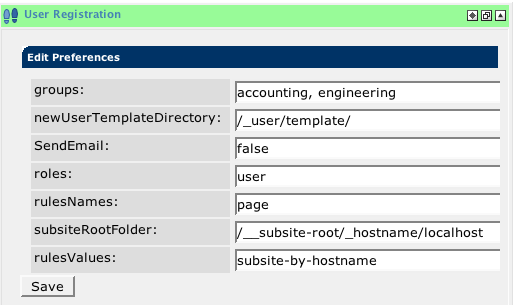 Profiling Rule: choose a profiling rule to assign to the new user that has built in subsite support such as the example used in this document: subsite-by-hostname. Subsites: from the dropdown select the subsite to assign as the home subsite to the new user, or leave blank to use default /_user home. rulesValues: choose a profiling rule to assign to the new user that has built in subsite support such as the example used in this document: subsite-by-hostname. subsiteRootFolder: the full path to one unique subsite root folder.